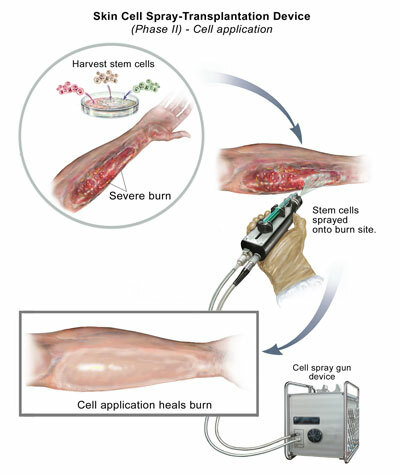 Spray-on skin is under development at the University of Pittsburgh for use with burn victims. The mortality rate for victims suffering from full thickness -3rd degree- burns is high, due to the limits in availability of healthy skin cell area. Biotechnology and tissue engineering methods lead to the use of skin cell cultures, taken from the patient’s healthy skin areas and expanded to cell sheets in Petri dishes. These methods, however, are not yet advanced enough to help in more severe cases. Pathophysiologic problems include serous fluid blisters between the transplanted tissue sheets and the wound and the subsequent loss of cell areas, non optimal cell nutrition in the early phase after cell transfer, water- and electrolyte dearrangements in the wound, toxin accumulation, and pH dearrangements. The new skin cell transdermal spray technique developed by Jörg C. Gerlach, MD, PhD at Berlin University Hospital, Germany and at McGowan Institute for Regenerative Medicine, University of Pittsburgh can solve these problems. Use of the connective tissue skin fibroblast cells additionally and in parallel to skin keratinocytes, allowing better tissue reorganization in the wound (cell biology approach). Reduction of in vitro culture time to prevent differentiation of the basal keratinocytes in the in vitro phase. A faster and earlier therapy start is possible by islet-like distribution of single cells in the wound (cell application approach). Application of the “tissue engineering in the wound“ approach, enabled by the use of a temporary hollow fiber membrane capillary bed, perfused with oxygenated nutrition and dialysis medium (wound healing approach), also allowing drug delivery supporting wound healing and antibiotic therapy to address infections. These capillaries are placed during the initial two days above the sprayed cells and below the wound dressing (biotechnology approach). Over her lacerated right shoulder he sprayed art-derm; it sealed off the open wound, halted bleeding, and prohibited infection. Star Trek fans may recall the protoplaser used in the TNG episode Frame of Mind. Via PTEI. Thanks also to Winchell Chung (aka @nyrath on Twitter).